3 track promotional release in a printed plain white record company sleeve with inkjet printed CD. 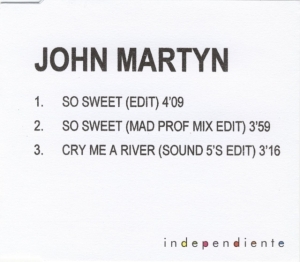 Three songs So Sweet (Edit), So Sweet (Mad Professor Mix Edit) and Cry Me A River (Sound 5 Edit). This CD was subsequently released in a fully printed card sleeve. Released around 1st May 2000 and produced in very small numbers.